473 in stock Need More ? Do you ever feel busy but not productive? If you answered yes to any of these, the way out is to become an Essentialist. 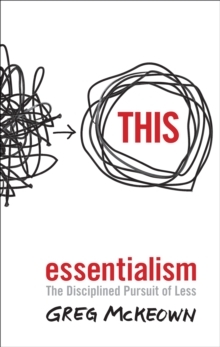 Being an Essentialist is about a disciplined way of thinking. It means challenging the core assumption of `We can have it all' and `I have to do everything' and replacing it with the pursuit of `the right thing, in the right way, at the right time'. By applying a more selective criteria for what is essential, the pursuit of less allows us to regain control of our own choices so we can channel our time, energy and effort into making the highest possible contribution toward the goals and activities that matter.